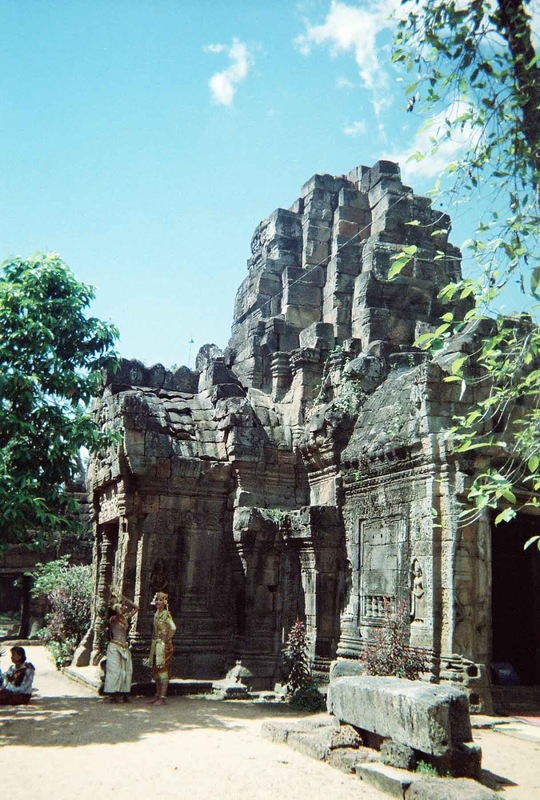 From Lovely Phnom Penh: Heading Into the Wilds of Southern Cambodia — My Crazy Adventure in Search of a Temple No-one Ever Sees Come with me to remote Southern Cambodia and share my quirky search for a fifteenth-century temple with a romantic history. Take THE STYLE SALONISTE break to read this adventure. Pour a flute (or two) of chilled Champagne, or put on the kettle to make a pot of Assam or Darjeeling tea. Place a handful of slightly salted almonds on a little silver tray beside you. Oh, and a lovely chilled Montrachet could be perfect. This is a trip beyond the guidebooks, into unknown lands, and without maps, definitely. After a week in Seam Riep, I was in Phnom Penh. Traveling alone (with a car and driver) I planned a day of temple hopping into far-off Southern Cambodia. I’d researched and studied, had several temples to see, and planned to wander. I was not ‘templed out’. I wanted to go to a distant region alone—a bit risky, perhaps even a bit dangerous—and if it all went wrong there would be no regrets. Well, that was the idea. 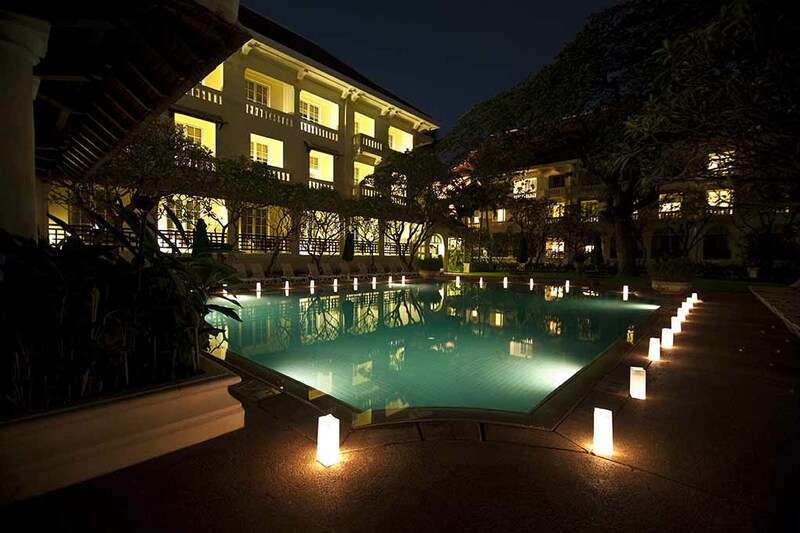 I arrived in lovely Phnom Penh to stay at the historic Raffles Hotel Le Royal. It’s the top hotel in the city (President Obama, Hillary Clinton, Australian PM Julia Gilllard were recent guests during an Asian summit). 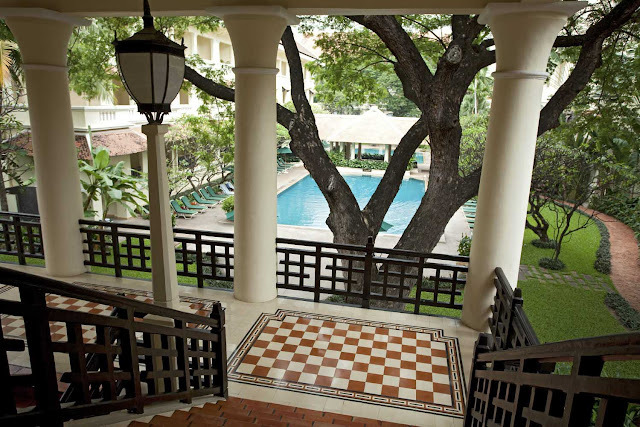 Little of historic colonial architecture remains in Phnom Penh, so the hotel is a lovely survivor, a graceful legend, and a vivid memory of earlier times. Raffles Hotel Le Royal discreetly faces a wide avenue, and is surrounded by frangipani-scented tropical gardens. It’s quiet and understated, with neatly uniformed attendants, but no big self-important flurry or flash and dash. I admired its discretion and low-key style. The original building—with its original cool patterned-tile floors, shuttered windows, sheltering balconies, shaded terraces, and terra cotta roof—is intact. 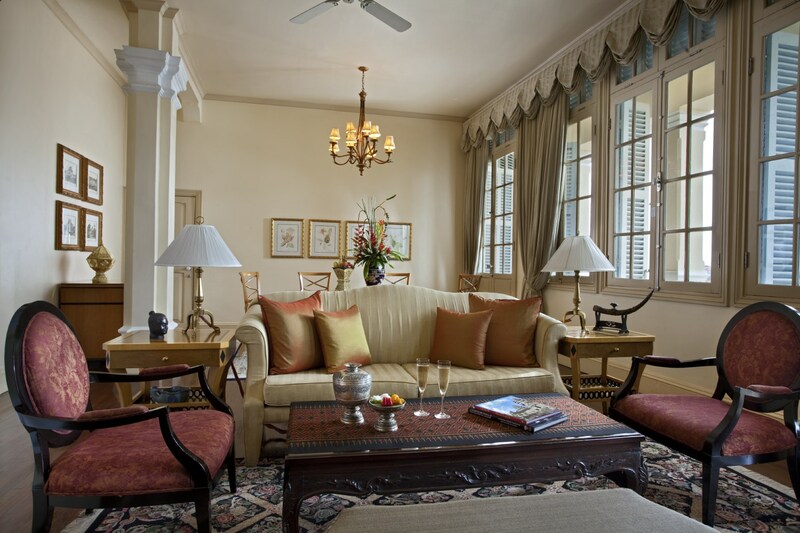 In fact, an arriving guest might imagine that the hotel has simply been given a spruce-up. It feels, still, like the elegant and rather private hotel it was. It still feels like a tropical outpost, but Phnom Penh has emerged as an international center, and the hotel is world-class. 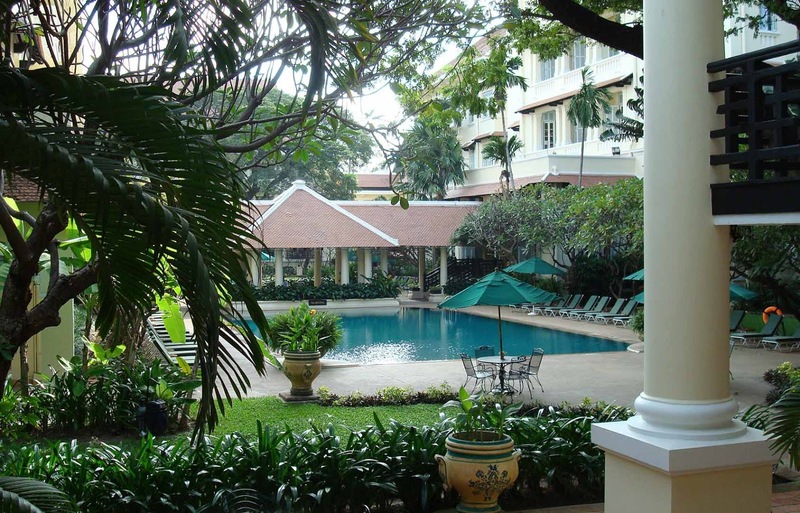 I’d arrived in Phnom Penh from Angkor Wat/ Seam Riep, and took a walk around the quiet residential neighborhood. 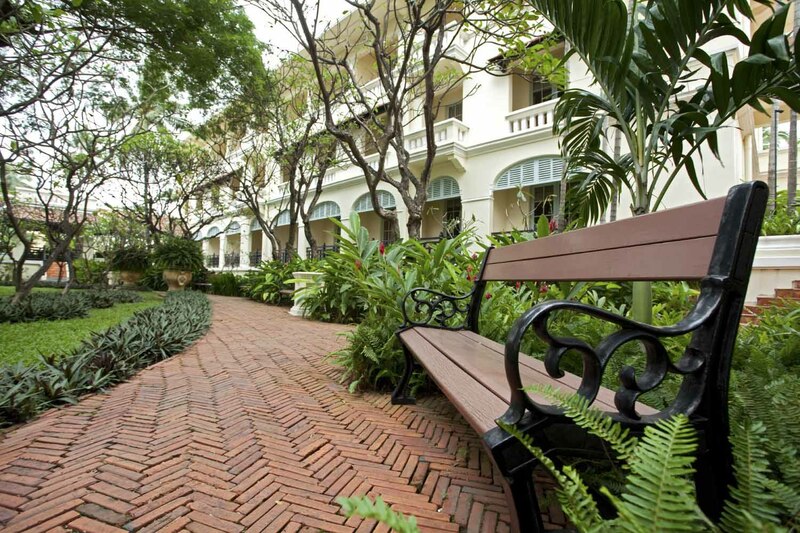 Raffles is situated near the American Embassy, and several business schools are nearby. Students approached to practice their English, and always to ask ‘where are you from’. These neatly dressed and beautifully groomed twenty-year-olds (men and women) are serious about their studies, and when I asked them about their plans once they’d completed their courses, they all told me with utter seriousness they planned to work for major hotel chains, travel, international banks, as well as for their family companies. One student, completing his MBE, said he was headed for a career in international finance. This is a great sign of Cambodia’s exciting emergence. I headed over, via a chugging old tuk tuk, to the National Museum to see its trove of pre-Angkorean statuary from Southern Cambodia, as well as Hindu statues that had been originally in temples near Seam Riep. 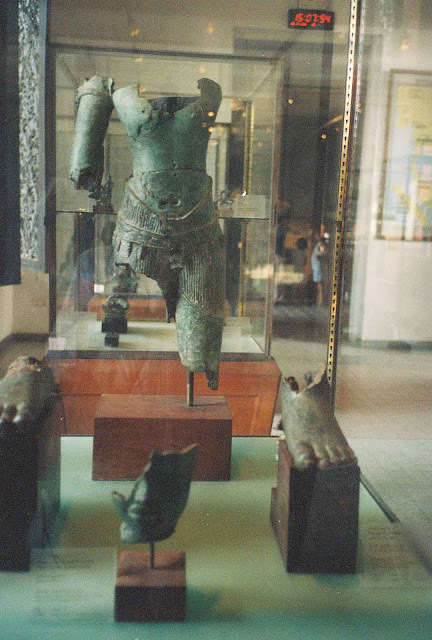 Many historic pieces were recovered from looters. I wanted to see the elegant bronzes, and a series of Hindu and Buddhist sculptures. In particular, I’d heard at the national conservation center in Seam Riep about a trio of statues in the Phnom Da style, sixth century, that are major works of art, and a highlight of the National Museum collection. I took these shots on the fly, very covertly (no photos allowed). 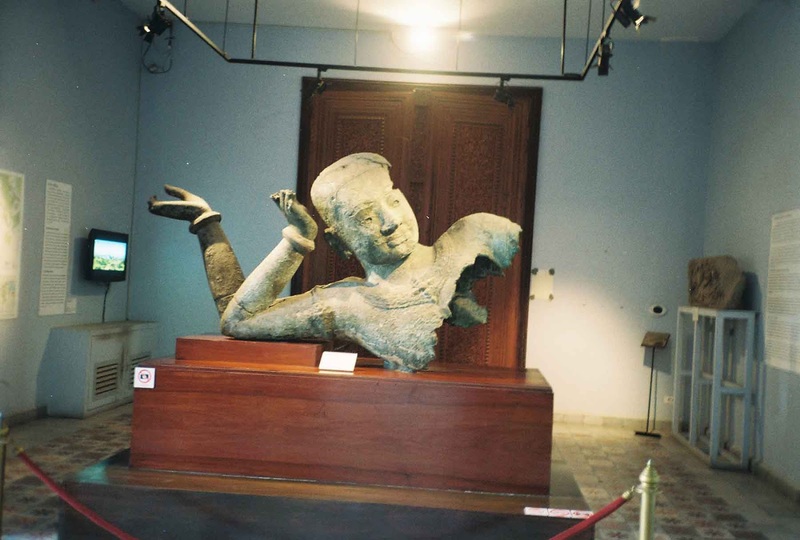 It’s a bronze reclining Vishnu fragment recovered from the Angkor Wat region in 1936. Rana, left, and four-armed Vishnu, center, and Balarama, Phnom Da, 6th century. 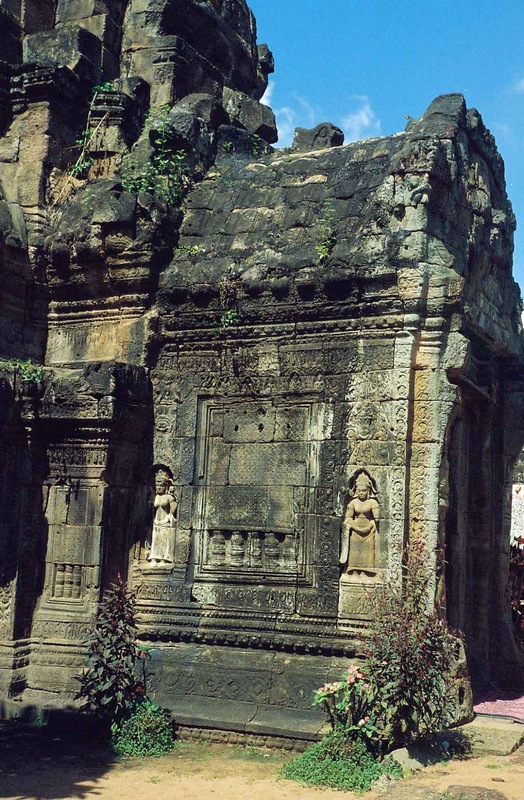 Khmer sculpture from the fifth to the eighth century showed a focus on the divine form. I loved the powerful Vishnu statue, along with his cohorts. Even in these fuzzy handheld shots, you can see the vibrant artistry and life of these figures, the exquisite detail on their hard stone surface, and the cohesive embellishment. 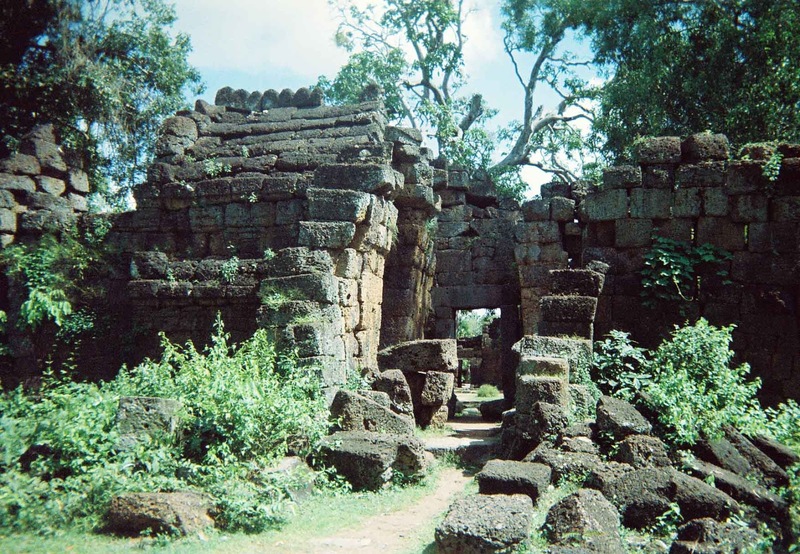 They were discovered in 1935 by French archaeologist Henri Mauger in the Phrom Da temple in theAngkor Borei region on the Southern Cambodia coast. The style of the carving is known as ‘Phrom Da style’ after the temple they once adorned. If this trio were in the Louvre it would be a major attraction, and would be considered one of the treasures. Vishnu has four-arms that indicate his all-powerful and all-pervasive nature. His physical existence is represented by the two arms in the front, while the two arms at the back represent his presence in the spiritual world. 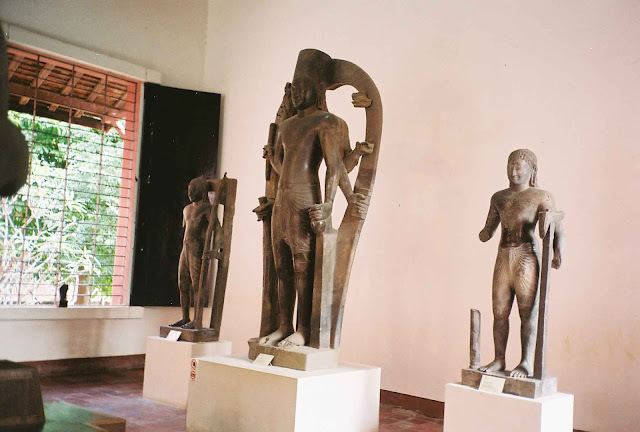 Balarama, right, holding a swing cultivation tool, looks rather like a country cousin of the ultra-refined Greek and Roman statues featured in the collections at the Louvre. 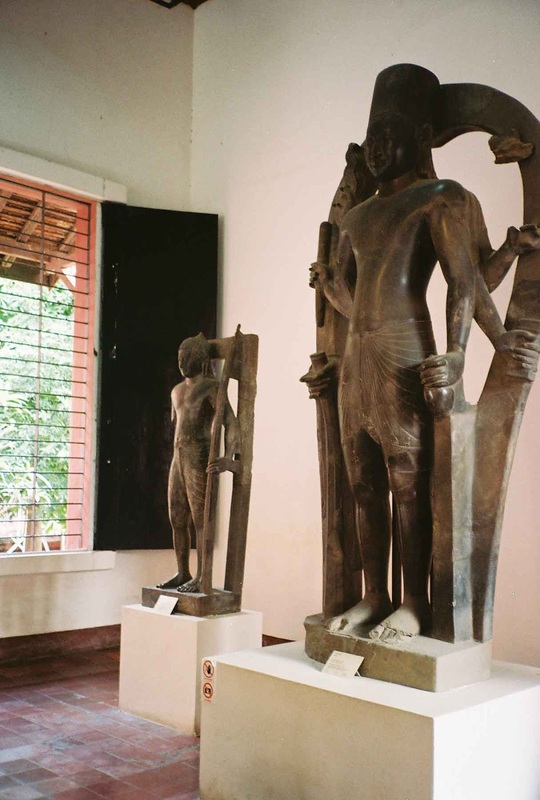 Surprisingly, here in the National Museum, these masterpieces, Balarama, Vishnu and his avatar are protected only by rather flimsy-looking metal bars on the windows, and simple wooden shutters secured with one metal bar. Yes, during the day there is attentive staff (making sure I did not take photos). The statues’ omniscient and mysterious gaze, perhaps offer their protection, along with their beauty. 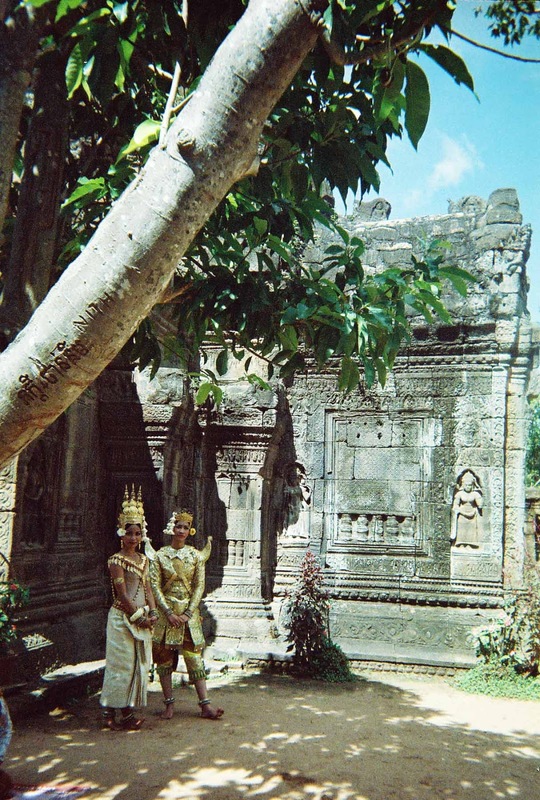 They are the earliest known Cambodian sculptures. 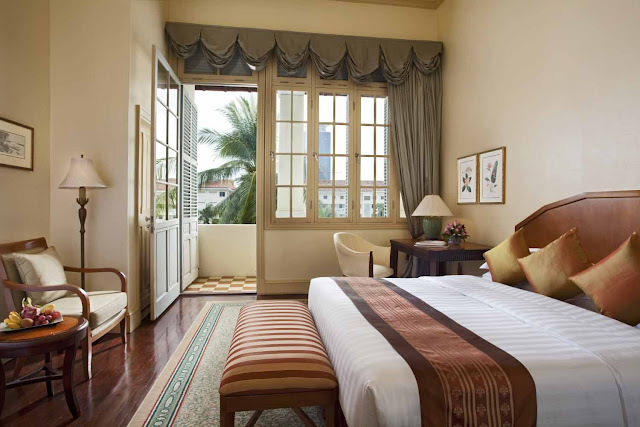 “The Mekong River, with its long umbrageous walks along is banks and the temple-crowded hill are the two features of Phnom Penh. 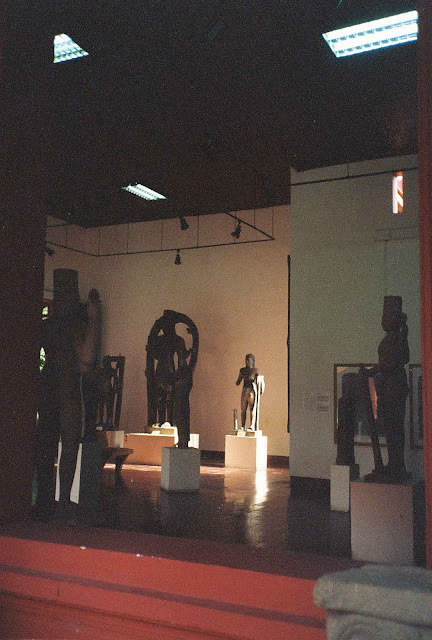 But the museum constitutes for me the chief interiors in the town, for it houses the principal collection of bronzes in Cambodia, a collection far finer than any existing in Saigon or Angkor. 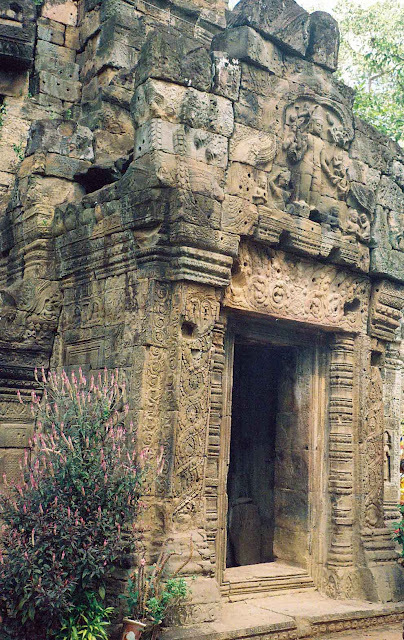 In these galleries, the traveler begins to realize for the first time the extent of Angkor, and its aesthetic status, before ruin over took it. —Osbert Sitwell, ‘Escape with Me An Oriental Sketch-book’ (first published in 1939, and recently re-issued by Oxford University Press). With my driver, and a lovely picnic lunch, I set off from Raffles hotel in Phnom Penh to visit rarely seen temples such as Ta Prohm and Phnom Chisor, and to find Phnom Da the temple where the three noble statues in the National Museum had originally been created and worshiped. When I asked the travel desk and managers at the hotel about the trip to Phnom Da—how far, how many hours, best sites—they were very encouraging and helpful but said that as very few guests go there (make than none), they did not have exact or precise up-to-date information concerning the roads, the ferry, or the route. I would be the ‘researcher’ in effect. The first stop was Ta Prohm temple about an hour south of Phnom Penh. This is village Cambodia, a hidden corner of rural life, a simple temple inhabited by elderly nuns. 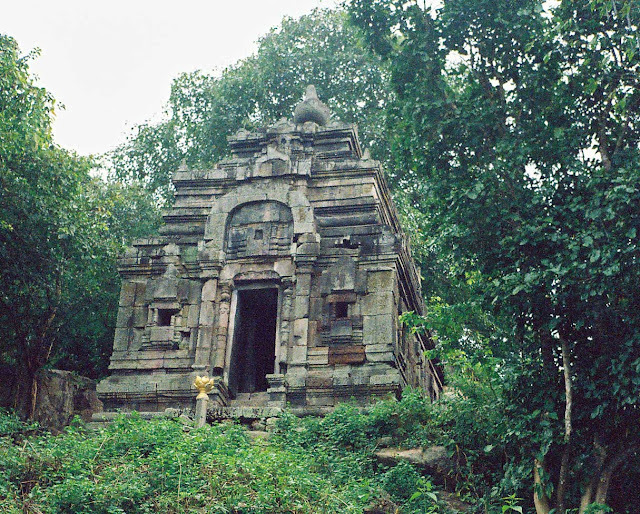 The temple, once a university and center of religious learning, has been well maintained. Best of all I was able to contemplate its carving and interiors alone. There were no tourists, no signs, just a centuries–old sanctuary with its complex array of gods and goddesses, avatars and symbols, its resplendent authenticity transcending time and the mundane. Bliss, indeed. 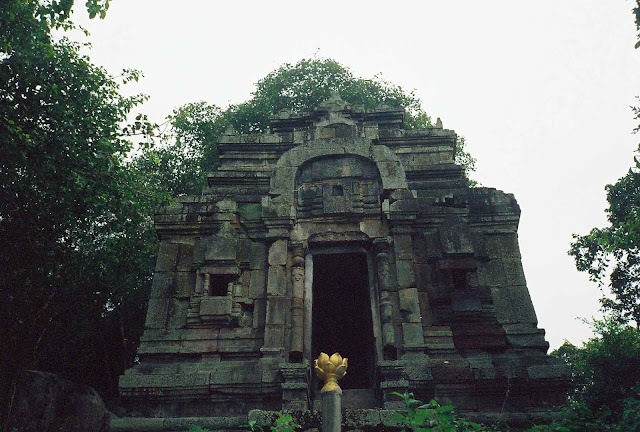 The temple was said to have been there since the fifteenth century. The silence of the jungle is all around. I lingered in the shade. We were heading for the coast and in about half an hour, we arrived the small scruffy towof Takeo. The region is in a delta, near the Vietnamese border, and as it was the rainy season, was inundated by waters of the mighty Mekong River. We drove through agricultural land, rice fields, and simple thatch-house villages. At Takeo, the plan was to take a ‘ferry’ to the island of Prohm Da. In theory! The information I had gathered in my fine-tuned research was that in the rainy season (this was it) a ferry would be at the ‘dock’ and it would be a ten-minute crossing to the 'island'. Instead, the driver and I found a sole dinghy, a small fiberglass boat with an outboard motor that seemed to have been cobbled together from a few spare motorcycle parts (or a sewing machine…). This was the only boat on the riverbank. Not exactly the scheduled ferryboat I’d envisioned. I glanced across the waterway. There were canals and flooded fields for miles, with perhaps a smudge of a green island in the cloudy distance. We negotiated the price (I think something like $US20), and my driver grabbed an umbrella from the boot of the car. We headed out across the water, Canal No. 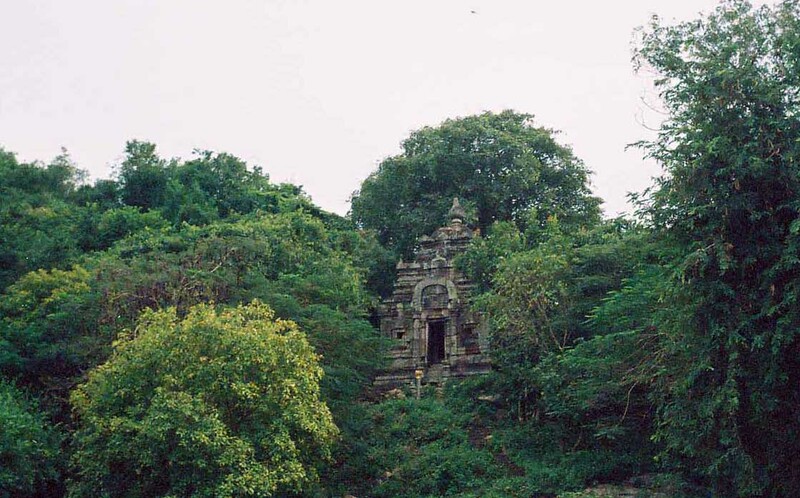 15, to places unknown, Phrom Da temple I hoped, the boatman, the driver, and me, with a flimsy umbrella, cameras, and a Clif bar or two. The clouds seemed to darken the moment I got in the tippy boat. We sped across the muddy canal, smoke drifting out from the loud rough-throated motor. One Hour Across the Flooded Delta The two pictures I managed to take as the boat plunged forward show the sandy alluvial ricefields, and a Vietnamese mountain range just a blur on the horizon, and ominous clouds. We saw fishermen catching lobsters with their bare hands on the banks, and no other boats. It as thrilling and full of the unknown. I spent the hour looking for signs of a temple or a hill on the horizon and worrying that the boatman did not have any extra fuel. We crossed one final canal and I saw a dock and a green hill, a scrappy village. The driver and I jumped out onto the muddy bank, and headed up the hill to find Phnom Da. A village fellow followed us, pointing ever upward, steps and more steep stone steps. At the top was the temple I had come to see. It had taken heavy artillery or bomb damage, and was mostly destroyed. ‘Khmer Rouge,” he said. 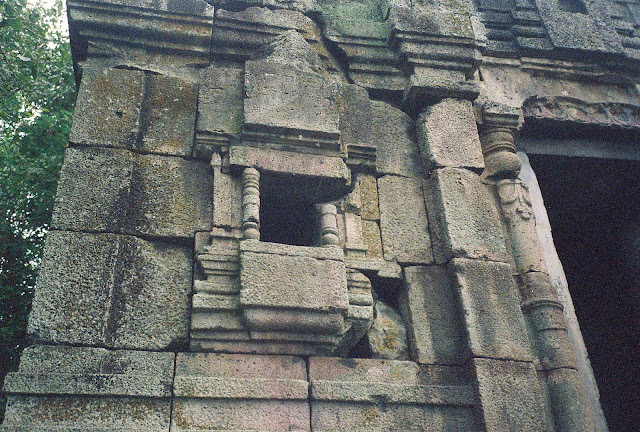 The interior had been looted. Fire had burned a brick wall. 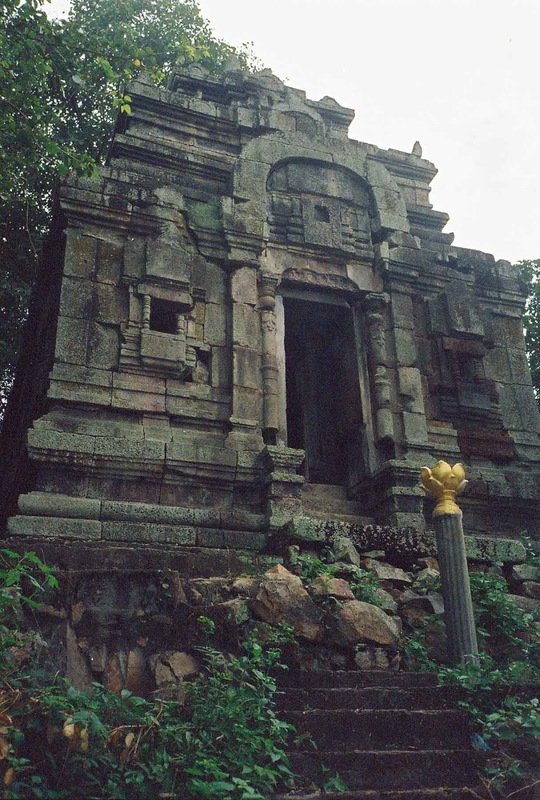 Perhaps this was not Phnom Da. I made the most of being there, taking in the 360 deg view of the surrounding delta, the cradle of Khmer civilization, and walked around the temple. “Temple?” I asked our village expert, hoping that this was the wrong temple, or that there would at least be another temple. “You, come,” he said, sprinting down the hill barefoot. We scampered down, and then plunged into the forest. This was no time to consider whether it was a good idea. I had to see a good temple. Finally, we turned into a sheltered clearing and there was the most charming temple, totally crafted in granite, and therefore very rare (most are brick or limestone). “Monk temple,” beamed our friend. The monk was away on a pilgrimage. We climbed up through the overgrown steps, and I snapped the temple as we ascended. 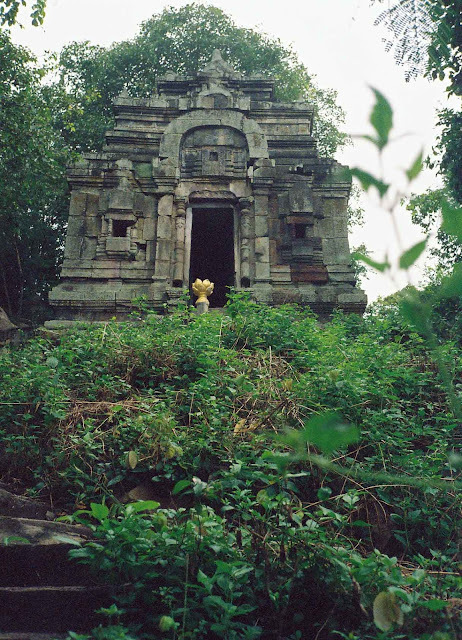 This no-name temple was, in the end, one of the most charming temples I saw in Cambodia. 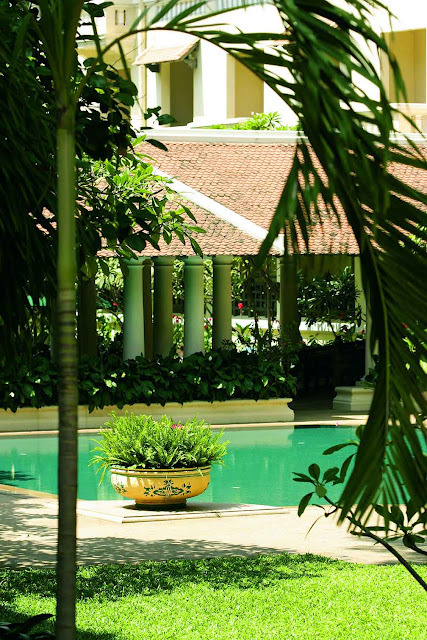 The smallest, certainly, built far from royal acclaim and far from the chic structures of Angkor Wat. Highly talented stone workers/6th century architects had created a two-person temple as deftly and expertly as any Greek or Roman temple. We lingered there, and I gazed at it from all angles. It was my last temple in Cambodia, and one of my absolute favorites (with heavy competition from Boeng Malea and Preah Khan). We returned to the rather dubious (it must be admitted) dinghy, jumped in, and roared off for a quick look at the river town of Angkor Borei (several restaurants in San Francisco are named after it…the name more glamorous that this fishing village) and the local archaeological museum there. It was a small, sweet collection—but I was ready to head back to the big smoke. Half an hour later, as the boat sped across the intricate and complex array of interlocking canals, I glanced back. A great black monster of a rain cloud seemed to be speeding toward us. “Faster,” I said nervously to the boatman. He was going as fast as he could. The atmosphere changed, a chill descended, the wind whistled, and felt like a vacuum, the air sucked out, with no sign of Takeo. I grabbed the umbrella. I imagined what I would do if we were thrown into the water. 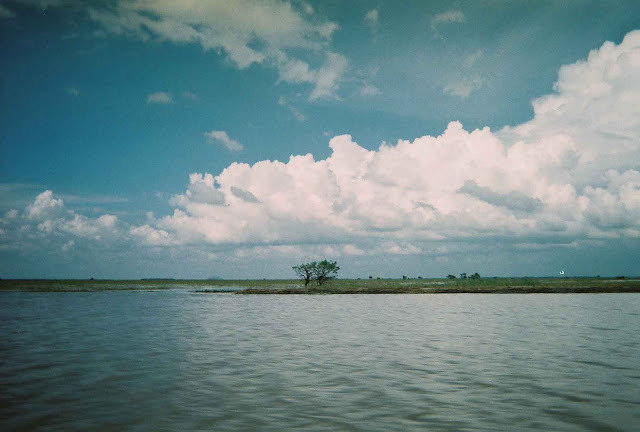 We skimmed the water, the cloud was on top of us, and suddenly I saw stilt houses and we pulled up at the muddy bank. At exactly that point, huge hailstones pelted down, and rain drenched, the hurrican-like wind whipped leaves off trees. The driver ran ahead, opened the car door, and I leaped inside. If the storm had hit seconds earlier, the boat would have been swamped. Mercy! I wondered if we could even drive through this downpour. We did, crashing through flooded narrow roads, and through dark villages without power (I was told that electricity, from Vietnam, was too expensive for country folk). It was now about 5.30pm and dark. I’d forgotten about my lunch. 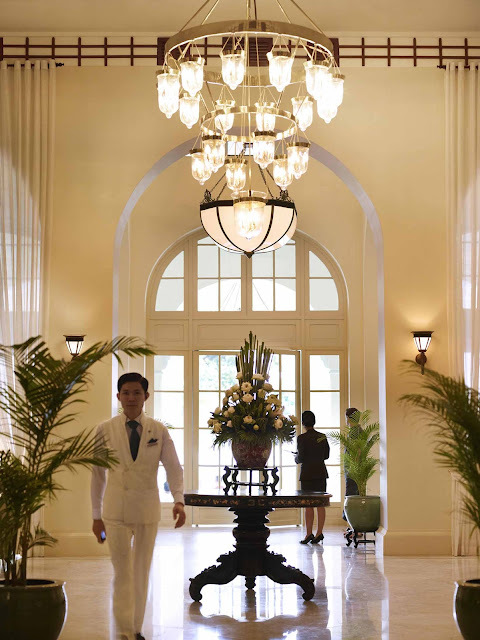 I opened the basket, and feasted on cheese, lettuce and chutney sandwiches (crusts neatly trimmed), a lovely fruit salad, chocolate cookies, a Thermos of tea, and tasty little morsels of patisserie and candies the Raffles staff had thoughtfully provided. I shared with the driver. An hour later, we pulled up to Raffles. Would a fellow traveler have enjoyed the chase, the thrill of being ‘lost’, the heart-stopping moment of going in search for a temple/site for Louvre-quality statues, only to discover it was bombed, burnt out, destroyed? I’m not sure. Would even my most intrepid friend have jumped in that tipsy boat, with its ‘sewing machine’ outboard motor? Maybe. It was one of my craziest ideas. I’m so glad I did it. Nothing like it. Now, onward to the next adventure. It proved to be the perfect headquarters for me, with worldly and polished management, and charming and helpful Cambodian concierges, front desk staff, travel desk staff, and everyone I encountered there. I relied on them for travel arrangements, cars and drivers, directions, suggestions, planning. I was meeting friends, and they arranged restaurant reservations and efficient transportation. I dropped in to check out the spa and the gym. They looked inviting, but I had a palace to visit, a morning market to explore, people to meet. Next time. 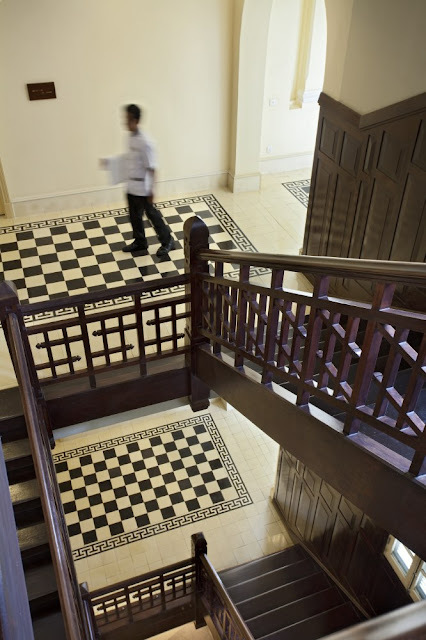 In Cambodia, with so many unknowns, the hotel offered me a sense of security. It enabled me, in a sense, to explore more boldly. The architectural details—exterior and interior—in classic repetition, bestowed a graceful ease and calmness. The French-Colonial décor, including the original lighting and antiques, and patterned tile floors had been deftly updates. In the morning, I had breakfast on my terrace overlooking the garden, framed with scented frangipani and spider lilies, and alive with the twittering of chatty little sparrows. One morning, after an evening of tropical downpour, the birds were out practicing their scales, ‘do,re,mi,fa,so…’ and the air smelled of rain-splashed leaves drenched and exotic flowers. Breakfast: Fruit: fresh papaya with lime juice, pineapple slices, bright pink jackfruit, mangosteen (like lychee) and passionfruit. Coffee. Splendid, as I read the local papers and faxed copies of the International Herald Tribune. During my stay at the hotel, the Cinema Paradiso program was replaying ‘La Dolce Vita’ in the poolside garden. Other recent selections included ‘High Noon’ and ‘The African Queen’. 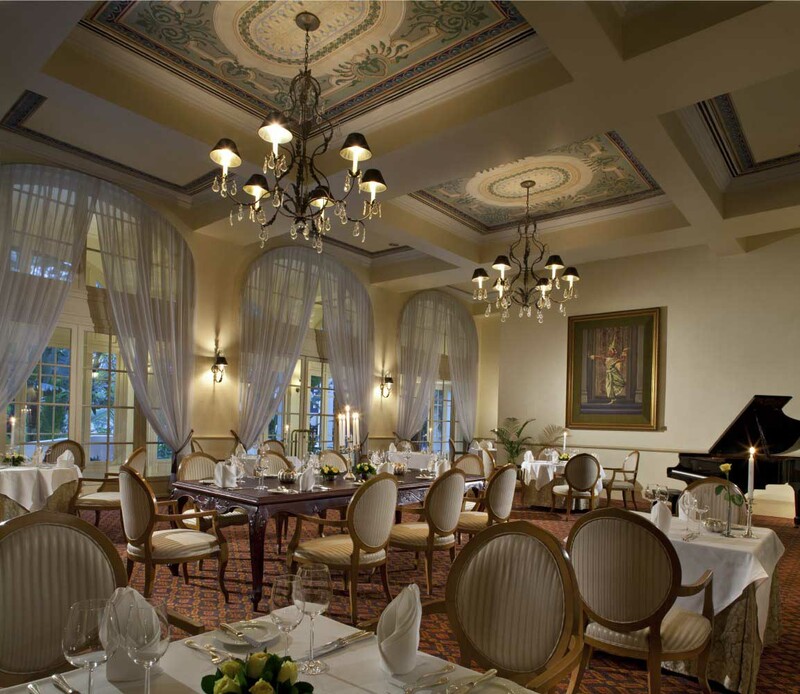 I enjoyed lunch at the Café Monivong, with a menu of international and Asian/Cambodia cuisine, and dinner at Restaurant Le Royal with a Royal Cambodian cuisine and modern French cuisine menu. 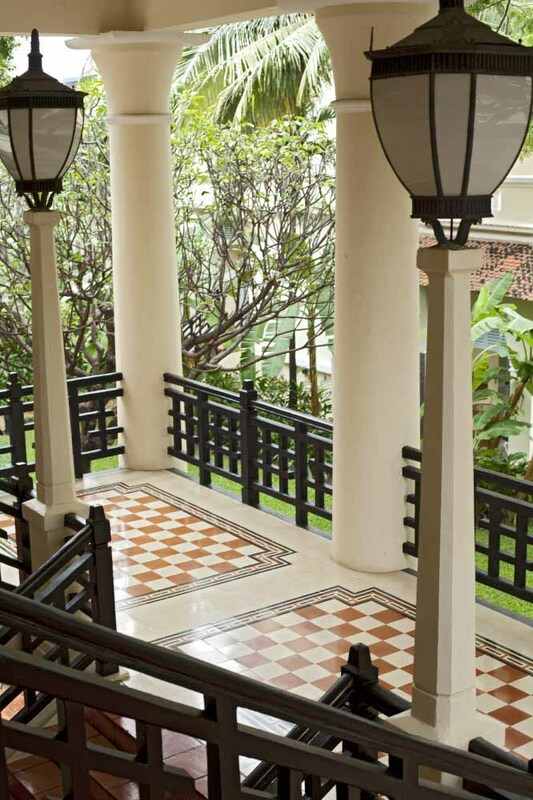 The hotel has a very international style, with a touch of historic Indochina. And I met friends at The Conservatory for a traditional English afternoon tea, charming and just the ticket after an afternoon of museum visits. The hotel’s newspaper/magazine/book shop, which was positioned on the way to my suite, also offered a lovely selection of French patisseries. The International Herald Tribune and a slice of passionfruit-infused fruit tart are a marvelous combination. Images of Raffles Hotel Le Royal Phnom Penh courtesy Raffles, used with permission. 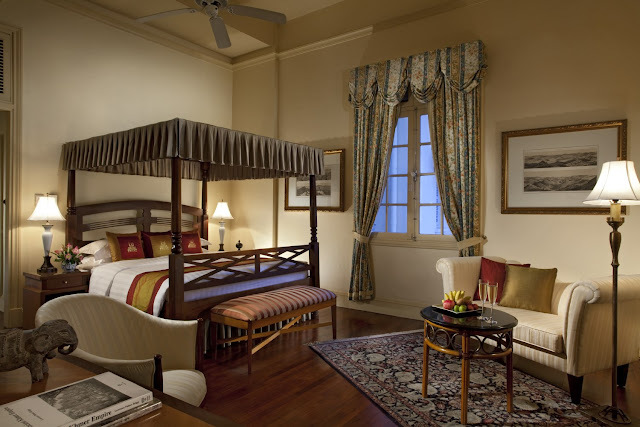 Raffles Hotels & Resorts is an international hotel company with a history dating back to 1887 and the Raffles Hotel, Singapore. 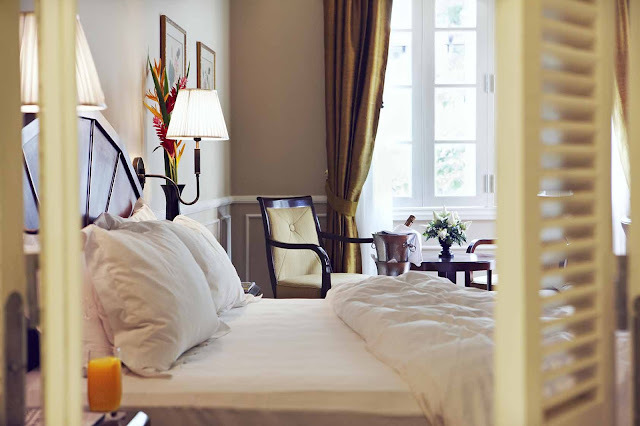 The portfolio currently comprises eight luxury properties in locations around the world: in Singapore, Cambodia, China, UAE, Saudi Arabia, Seychelles and Paris. The company is embarking on a new phase of expansion, I was told, with openings in Istanbul, the Maldives, Indonesia, the Philippines, Turkey and China scheduled over the next two years. 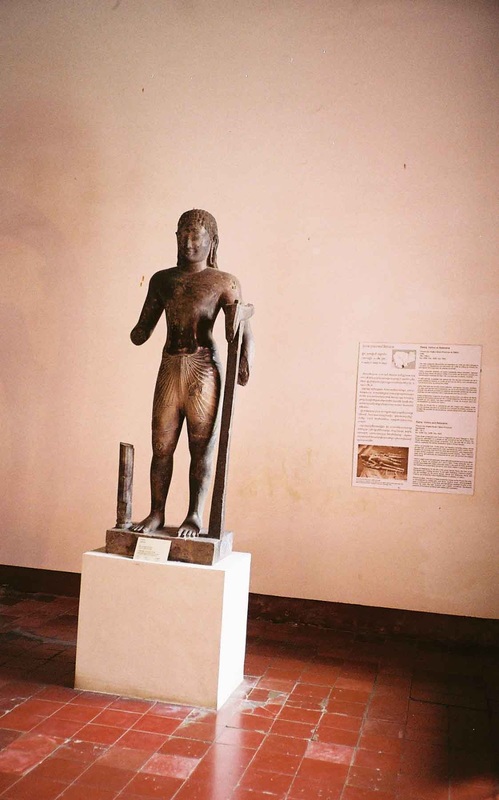 Photography of Takeo, temples and the Phnom Penh museum, by Diane Dorrans Saeks. Published here exclusively. May not be used without written permission of Diane Dorrans Saeks. 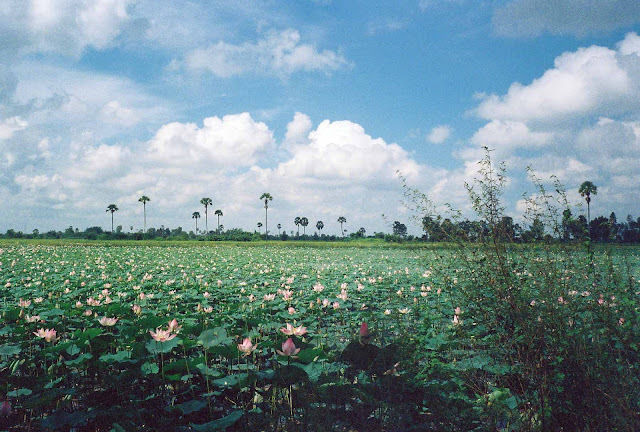 What another fabulous post from Cambodia... That water lily picture is fabulous - I tried to take a picture but it didn't capture it like yours did. What a lovely little adventure. I absolutely love the temples and the carvings. Seeing these takes me back all over again. I do understand the need to stay somewhere nice - as someone said about my trip and experience - the surroundings is just a dichotomy between beauty and poverty that one needs a refuge to come to at the end of the day. Thank you for this post - thoroughly enjoyed it! I was traveling alone--so a quiet, safe, and secure hotel like Raffles is essential for me. I also relied on the fine judgement and lovely care of the staff...ultra important and sensible. As it was...I found Phnom Penh very quiet and safe and walked around alone in quiet old colonial neighborhoods. But...I walk around Paris after midnight alone, and take the Metro late at night. It was an adventure down to Southern Cambodia--especially since the 'ferry' and 'wharf' and sense of some safe water-crossing proved to be incorrect. I love seeing places of which I've never seen a photo, an image...and plunging into the unknown. 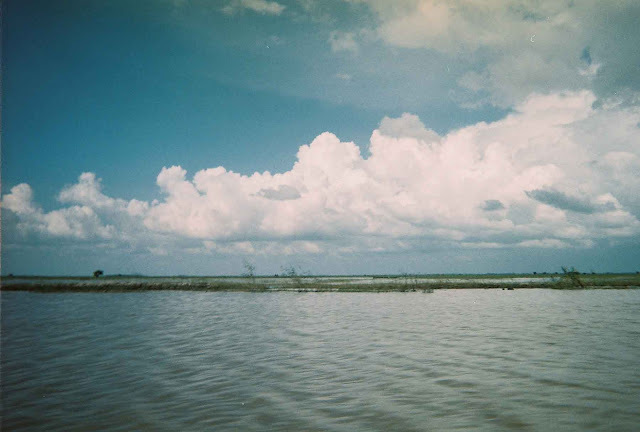 This was the rainy season--so the Delta was totally inundated. Must be completely different in the dry season. It was Sunday when I made the trip--so schools were closed. I usually visit schools and take education supplies (pens, pencils, wall maps,) but I missed the children that day. But it's always part of my plan in this part of the world. I love to talk to these young students and their lovely teachers. What a wonderful adventure, thank you for taking us with you. Surely those weren't elderly nuns at Ta Prohm?! 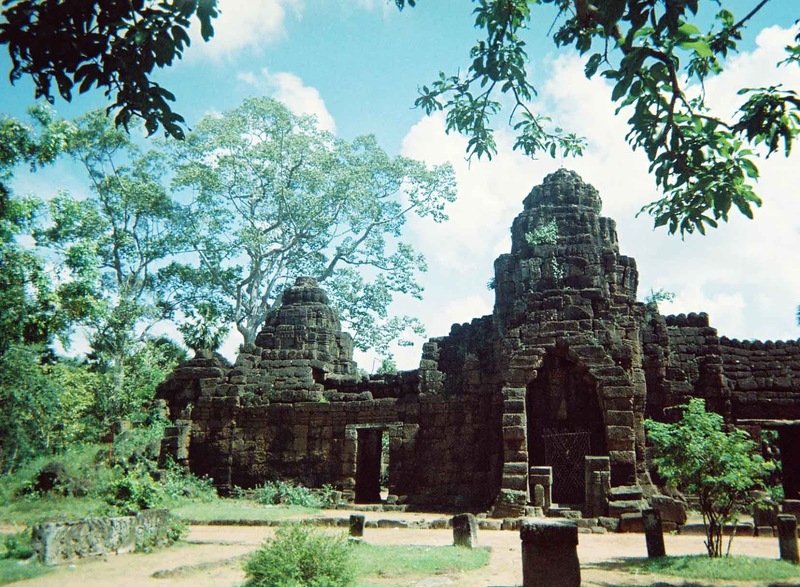 Thank you so very much for writing this series of posts on Cambodia. Your descriptions were so vivid I felt I was there. My son has been several times and now I think I should join him the next time he goes. Of course, I forwarded all three posts to him. Thanks so much for all the time and care you take in writing this blog. It is much appreciated. I've had overwhelming responses about the Cambodia posts and the Cambodia saga. Thank you all so very much. It means a lot to me to know that you've avidly reading to the very end...and that for many of you it is an inspiration to travel or to consider travel to this region. To all my friends (and I adore to know that you've forwarded these stories to loved ones)--I would say, "stay tuned' as I have many many adventures to come, and also upcoming are 'Encounters in India' from a recent trip 'off the map'. Keep your comments coming...I love them. Goodness, an adventure indeed, more worthy and real than Indiana Jones, or should that be Indiana Jane, in your case? I think I might have been panicking a bit with the swollen river and the elusive temple, and the alarmingly unreliable boat. But I have done those things, so I can't blame you! 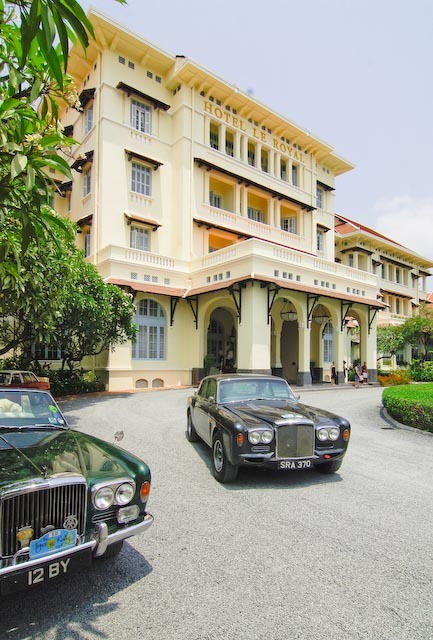 The Raffles Hotel Le Royal sounds ideal, and as others have noted, I too find it essential to stay somewhere that is both very comfortable and safe in an alien environment. We have not yet made in to Phonm Penh, as sometimes these excursions are just too similiar to the environment in which one lives. We are all guilty of that, and then surprised how much we learn from visitors to the country where we live! Anyway, I'm glad you have returned to tell the tale, and to share it with us. Yes, actually...the moment I stood on the muddy riverbank in Takeo (a not-even-one-horse town...)...and looked down...expecting to see a bustling jetty and a big old ferry boat...and there was no jetty and just this one funky little faded boat and the ...'outboard'...there was no going back. I had to find the temple. Already it was clear that a storm was coming. My guidebooks said 'the ferry takes five minutes'...and we were plunging through these ancient canals for an hour...I could tell we were heading East/South/East toward the Vietnamese border (so the region is full of history...truly). We were about 10 miles from Vietnamese border and the region had once been party of China, Funan. But I've been traveling in Asia since I was a student--so in some ways the flimsy boat, the non-English speaking boatman, the 'off the map' sense of it all, and the potential danger were all comfortable for me and familiar. I am a good swimmer, and I'm calm. For you...so close so it is not entirely exotic...I would not rush to Phnom Penh. For me it was a discovery and I loved every moment. Now, onward to fresh fields...I will keep you posted. I received such wonderful comments on FACEBOOK about this Cambodia series. I'm truly grateful, and happy if I am inspiring my friends to travel boldly. 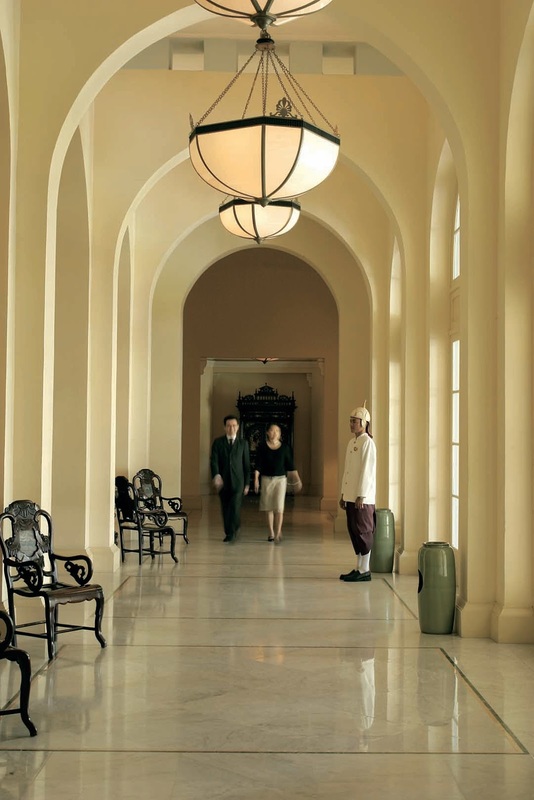 I've so enjoyed this photo-tour, getting to the source of Asian design, wonderful images and commentary. I haven't been to this part of the world in 20 years but I'm moved, with this suggestion, to return. I received this lovely message from TANIA VARTAN...Who is a fantastically talented decorative artist...who is highly focused on elegant paintings, decor, finished. New York is where she is based. This was superb! Thank you. So glad you quoted Osbert Sitwell; that's one of my favorite books. 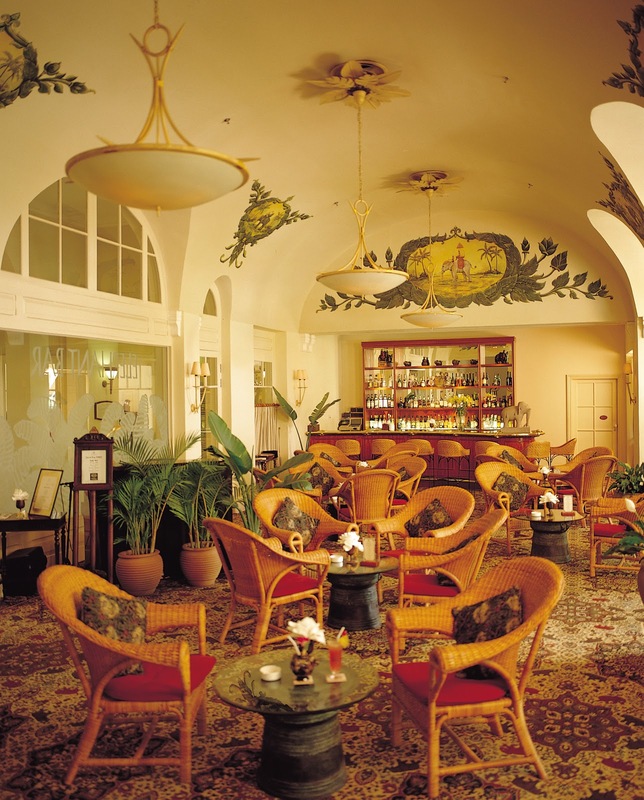 Do you know his" Discussions On Travel, Art and Life"? About Italy, Sicily and Bavaria. Delicious! Now I must order all his diaries! I received the loveliest note from the great Jennifer Boles, THE PEAK OF CHIC...who was such an inspiration to me when I founded THE STYLE SALONISTE almost 5 years ago. Yesterday’s blog post on your daring temple excursion was thrilling! I think that you are one of the most courageous travelers I know! I'm thrilled--you are such a distinguished member of my troupe of lovely readers around the world.